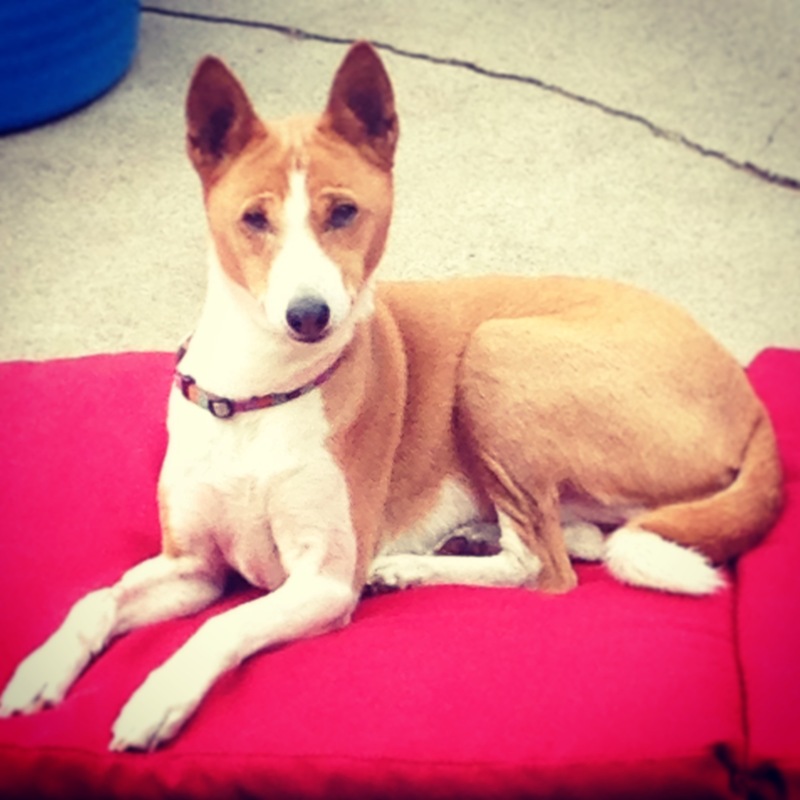 Halo was my basenji of 12 ½ years. It feels weird to say, “was” because only yesterday I was saying, “is”. I wouldn’t normally write about something so personal to me on this blog, but I’ve been in a daze, and I am finding ways to feel some healing in these early moments- and writing it out is one of those ways. 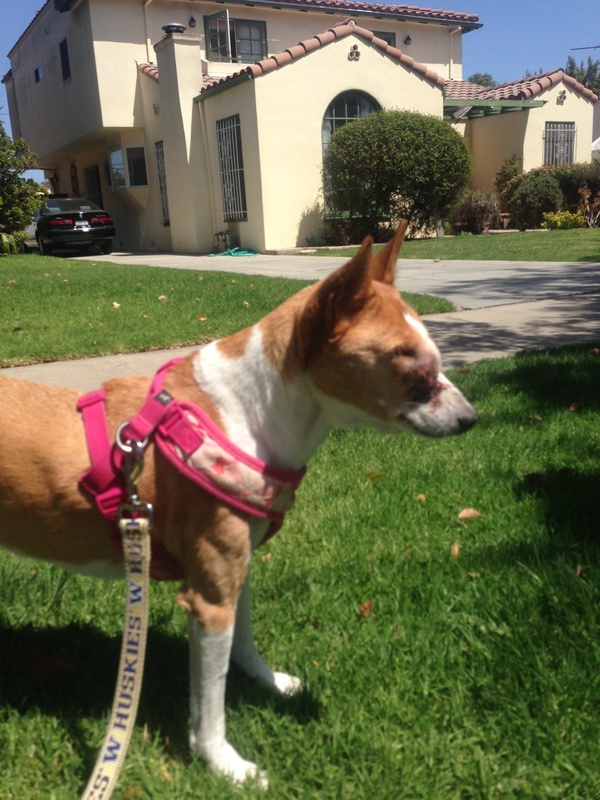 Halo was a healthy, active purebred basenji girl. I got her as a 7-week old puppy. She was the most stubborn, crazy, weirdly lovable dog. In November 2013, she started violently sneezing. After a battery of tests, I was referred to a specialist in January who placed her on meds until a CT scan was conducted in March, diagnosing her with Nasal Carcinoma, an inoperable, incurable sinus cancer. At the time of the CT, the oncologist let me know she had three months to live. She only made it two. But the main, second reason I am writing this- is for grieving purposes. This is more for me to get out the emotion I have had for this little girl for so long and keep a record of this day. I just don’t want to forget it. Even though I write this with sadness, the heaviest heart, and tear stained cheeks, I write it because despite the awfulness of the outcome, it was one of my most favorite days with her. I woke up this morning to find you already awake on my bed. You’ve struggled to breathe the last few days in the morning… waking me up to help you somehow. Walking down the steps I bought for you when you couldn’t jump anymore, and pawing at my bed, demanding that I pay attention! Today you were quieter. I thought for a moment, do I call the vet? Is this it? Maybe wait and see. Or maybe there is no time to wait. We got up like usual and you were ok walking. Normally, you pull back which signals me to pick you up and carry you. Or you just wouldn’t want to walk at all, which meant by default, I got to carry you. I carried you two walks a day for about six weeks. But today, you wanted to walk out the front door. I kept thinking- is this the last walk? I don’t know… It turns out, it was… sort of. We arrived back home and Angie said she was going to come by. Angie has known you from the time you were only 10 weeks old… and lived with you for a year (that year you tried to run away and after a thousand heart attacks I found you at the SPCA, remember?)…. so I had to get us moving. I made food for you… and you ate some of it. But something was off… your eyes. They had a far off look in them, a dazed look. And you weren’t being yourself- even your sickness self. I called the vet and told her it was time. They originally scheduled it for the next morning, but I knew you were suffering and would’ve been miserable the whole night, so I asked them to come in the evening instead. The date was June 1, 2014. You had been refusing your meds for four days now- being able to detect them no matter how secretive I was about camouflaging it. You originally ate around them, but then just flat-out refused them entirely. You were refusing cheese and Pill Pockets and Charlie Bears and everything you normally loved. Angie came over and you lay near us. You got up and pawed at the dryer…. why? Did you need water? Your lips barely touched the surface of the water when you drank. Your breathing had been laborious for a few days. I could see you struggling with every inhale, and every exhale through your mouth. Common, the vet said, for a growing nasal tumor. Then you came back over to us in the living room. You just stood there, your little body swaying ever so slightly. You were having trouble keeping balance, but did not want to lie down. You walked over to my guitar and pawed at it. ??? You’ve never done that before. Angie suggested maybe you wanted me to play for you. Angie and I looked at each other quizzically, and I picked up the guitar. I tuned it up and played the song Let it Be until you fell asleep. I never realized you liked it when I played the guitar. Angie and I had lunch, then she went to take a phone call in the backyard. That’s when you got up and pawed at the front door. You’ve never done this before?! When have you ever pawed at the front door?! But I know you and your paw communication… so I grabbed my phone, your leash and a dog bag and left an anxious Red and an unknowing Angie behind. You walked me- you led me to the terra-cotta colored house and just stood there with your eyes closed feeling the breeze- like you were free. I will never forget that look upon your face. It was quiet, peaceful, so sweet. The day was perfect, blue skies, no traffic, no helicopters or noise. I picked you up and you wanted to be put down… I put you in a patchy spot of grass under a beautiful tree. your eyes closed in the breeze. We sat there for two hours. You lay your head down on the grass. I sat next to you and pet you the entire time. I talked to you about all my memories with you and how lucky to be your chosen dog mom. How you were the first animal I took on my own, and loved and cared for … when you were only the size of my two hands. 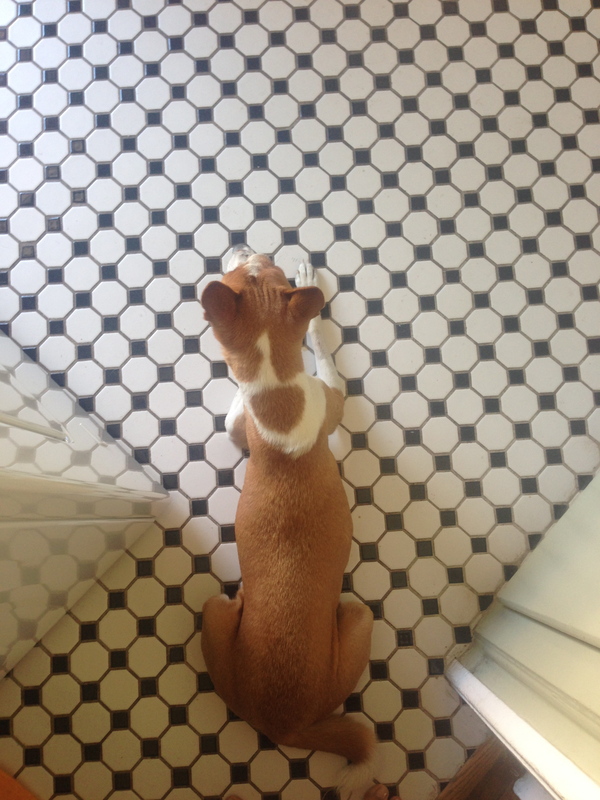 How little I knew when I was a 24 year old in Seattle getting talked into getting a little tiny basenji girl. You were so peaceful. And seemed happy… just happy being outside, on the bed of grass, in the cool breeze, away from Red, just having me all to yourself like you did when we first met. I told you, I’m so happy to be here with you right now- I know you don’t feel good, but I can’t think of a more perfect place to be with my girl. Angie came by to check in and find us, and watched you while I went home to grab a blanket and water and snacks. The three of us picnicked on a grassy median in the middle of LA. Angie left us and it was you and me for another hour. I didn’t realize just how much you loved a nice patch of grass! I should have known, you spent many hours in the six years at our Hermosa Beach house sunbathing on the lawn. I needed to go home and use the restroom and plug in my phone for the vet. You were not comfortable in the house, Red was all over the place, and you again, scratched at the dryer. I picked you up and took you back to the shady spot… but you chose a different spot this time around. You wanted to stand again, but your legs wouldn’t allow it this time. I didn’t even need a leash- you were going to just lay in that grass peacefully. People, cars, even dogs walking by didn’t stir you at all… that’s when I knew you really were done, and was silently thanking heaven for telling me to call the vet and change the time for you. We had to come back because the vet would be arriving. I carried your delicate frame back toward the house. You pawed at the dryer once more, and this time, I opened it and inside were moldy sheets that I had forgotten to dry one week before!! You were so brilliant and communicative all the way to the end. I pulled apart the fence in back and set up a blanket for you under the tree in the back yard. You, Red and I sat out there for a half hour while the earth shook (a 3.7 quake) and the sun set. We listened to Angel by Jack Johnson, and Somewhere Over the Rainbow. You were struggling to breathe the air, shaking, and I promised you that I would help you get there. Your eyes told me everything, and I knew I had done the right thing for you. I asked you to please greet me in heaven or find me if you come back. I told you I loved you and how thankful I was to have had the privilege of having you in my life for so long. The doorbell rang at 740pm. You stayed on the blanket, shaking. I put Red away but I could see his head poke from the guest bedroom window. Dr JJ and the technician came into the back to meet you and to describe everything to me. You didn’t move. You just breathed with your eyes closed, I could feel your beautiful heart pounding as I held your little body. They were so kind and gentle with you (and me). I kept petting you, trying to memorize every hair on your head, the perfect little fur circle on your neck, your paws, your tail. Trying to remember everything about you like I was cramming at the last minute for a final exam. They poked the needle for the sedative and you jumped and shrieked… the first noise you’ve made in months (you used to be very very chatty). I grabbed you and held you tight as I had so many times during your seizures and times when you were uncertain. Then the sedative hit and you were so relaxed in my arms. I held you for five or ten minutes… I don’t know exactly how long, and they said whenever I was ready to lay you down they would prep you. I gently laid you down and held your head in my hands. You were still struggling so hard to breathe even with the sedative. They shaved the area to place the IV, and little white hairs fell on the plaid blanket. When they had found your vein they told me whenever I was ready we could move ahead. For a fraction of a second I wanted to shout, No! I’ve changed my mind! but I had seen you suffer all day and didn’t want you to hurt any more. I held your head in my hands, kissed your face and whispered, “I love you baby girl,” and then your noisy breath went quiet. I still held your head in my hands. Dr JJ told me you had passed. They went outside to get the aftercare guy and I was able to have you alone for a few minutes. I wept over you and kissed you all over – I caressed your face, and rubbed your paws, and kissed you again and again and said I love you and thanked you for being my Halo. He came with a little basket that you fit perfectly into and looked so peaceful and beautiful in… like a sleeping angel. And they carried you away. You have meant the world to me these last 12 1/2 years. You made me laugh, brought me joy and comfort when others could not. In some ways, I am thankful you had cancer because I knew I needed to spend every minute I could with you. Cancer took away your funny and sweet yodeling baru sound, your anxiety, your curled tail, and your speed walk; but… in a weird way, transitioned me into preparing for a life without you. A new life without Halo. I only turned 37 the week before you left. Your fun, sweet little personality was basically in my life for a third of it, and the majority of my adult life. That is a hard hole to fill. I hope what everyone says it true… that you’ll visit me in spirit, in dreams, maybe show up again or just greet me in heaven. You were the closest thing to a soulmate I’ve ever had and one of the only beings to get deep into my head and my heart, push my buttons, and make me love you so much more for it. I thank you for every single day I spent with you- every quirky thing you ever did, and for being the smartest, most beautiful and wonderful creature in my life. I love you always Halo.